Chain restaurants aren’t my thing, but when the hankering for an evening libation strikes, I’ll test my standards at any place promoting happy hour when the stars are twinkling. 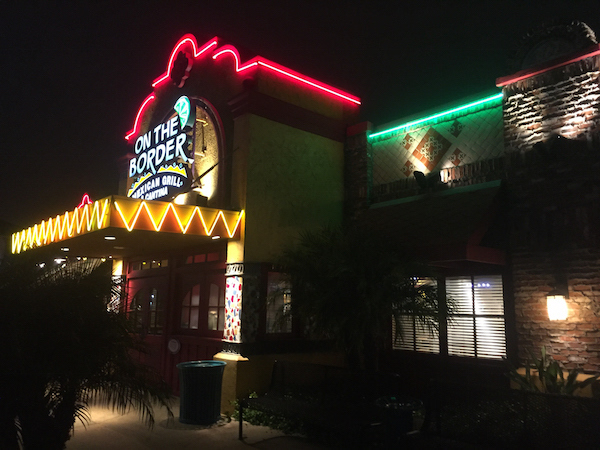 On the Border Mexican Grill & Cantina offers happy hour seven nights a week in addition to running it during certain daylight hours. 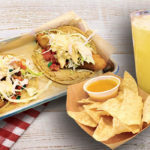 Prices for booze and food span across four value categories, starting at $3.75 for items such as fireballs, tequila shots, domestic drafts and trios of pork tacos, and capping off at $7.75 for Corona’Ritas, super grande margaritas, queso fries with chicken, and other items. 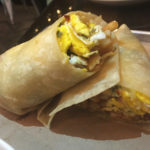 The establishment was founded in Dallas, Texas in the early 1980s as a hot spot for “border-style food.” Although since expanding to 147 outposts throughout the country over the years, the Mexican border seems like a distant notion no matter how close the location is to it. Sure, margaritas and Coronas flow like rivers. And the interior design features some of the vibrant colors and tile work of a border-town cantina. But I felt squarely in the commercial trappings of Mission Valley while sipping Exotico Reposada Tequila, which falls somewhere in quality between that consumed during spring break and what might be served at a Cinco de Mayo block party in the suburbs. I tolerated the bite and appreciated that only half the rim of the rocks glass was dipped in salt, allowing me to alternative between plain and briny. The accompanying fat wedge of lime I squeezed into the glass added a bit of dimension. The complimentary (and refillable) table chips are the size of cow tongues. 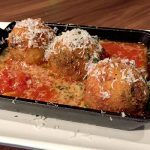 They’re served with bright-red salsa that could have used a little help from garlic or perhaps more cilantro. One round of each was plenty. As the tequila took fast effect, I ordered a pair of “avocado fry” tacos for $5.75, skipping over the chicken quesadilla in the same price group. 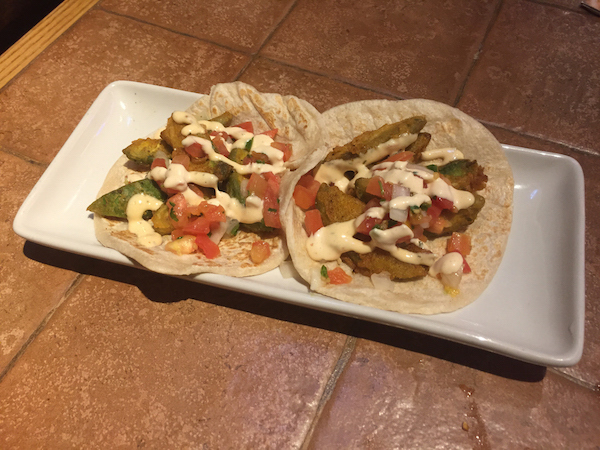 The tacos featured breaded avocado slices fried to the point of losing their creaminess. A non-spicy red pepper aioli drizzled over them compensated. Enveloped with tomatoes and onions in grilled flour tortillas, they were more filling than flavorful. 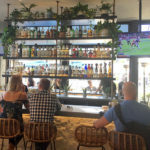 Happy hour patrons are relegated to the outdoor patio or roomy bar lounge, which features several flat screens, bright recessed lighting and easy access to bar backs doling out baskets of those oversized tortilla chips. 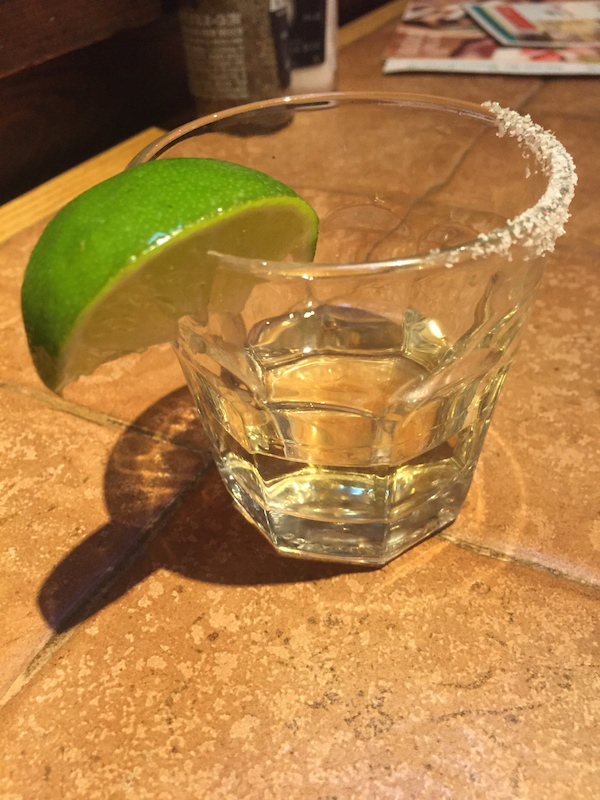 All the drinks you expect from a Mexican-themed cantina are discounted: tequila shots, fireballs, Dos Equis drafts, and margaritas made a few different ways. Domestic beer and Long Island iced teas are also on the list. 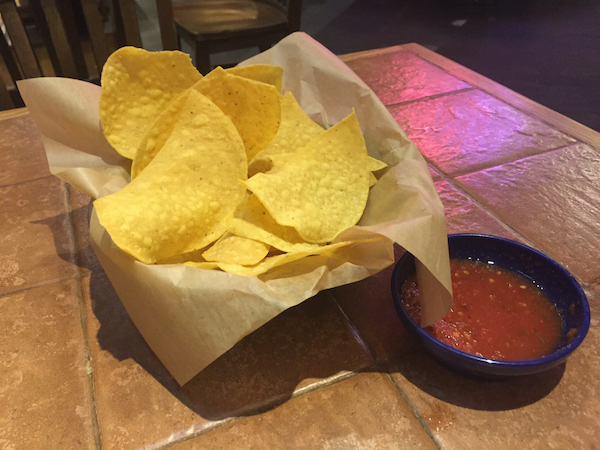 The biggest table chips on earth are served here with red salsa that lacks pizzazz. 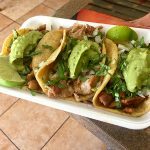 The “avocado fry” tacos tasted nondescript, and based on past visits, the food in general is Americanized for mainstream consumers. You’ll save about 20 percent drinking and noshing from the happy hour menu. The waiter was proactive in explaining various specs on the food and drinks. Better yet, he never pulled a disappearing act despite a full crowd in the bar lounge. Amid décor that’s frozen in the 1990s, lighting in the bar area was harsh and the volume on the flat-screen TVs was exceptionally high.